CURRENT INVENTORY | HOME | KNOWLEDGE INDEX | CONSIGN WITH US | CONTACT US | OUR PROCESS | FACILITIES | ESTATE AUCTION V/S ESTATE SALE WHAT IS IT WORTH? The professional rapid liquidation of estates, businesses, restaurants, resorts and hotels in Central Florida is what we are known for. Our process allows for hassle free off-site sale of your valuable antique and common furnishings. This avoids the intrusion and liability of on-site estate sales allowing you to sell and vacate the real estate in a trouble free, quick and efficient manner. 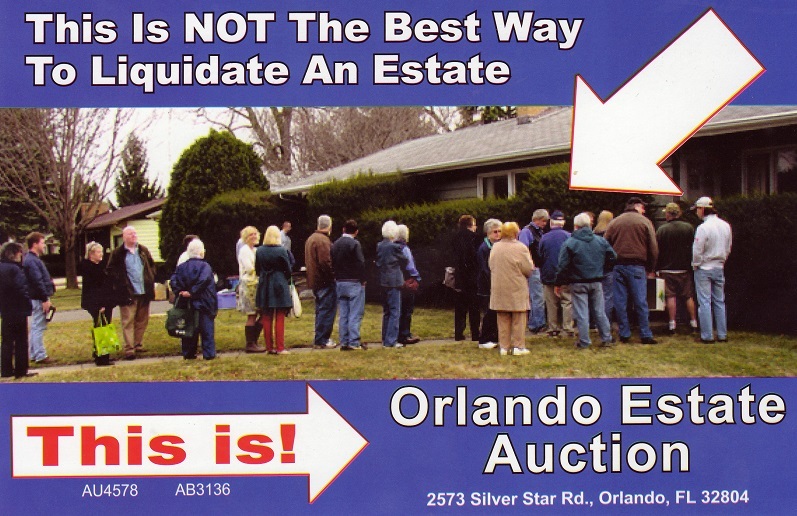 At Orlando Estate Auction our process averages 36 hours from first contact to pick up of your inventory and finishes within 2 weeks with a check and accounting of your estate sale items mailed to you. Our system is trouble free to the consignor and bypasses teh hassles and downfalls of conducing an on site estate sale. 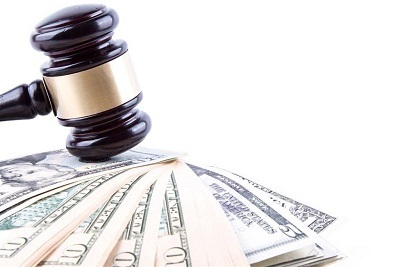 Estate sale by auction liquidation is a much more reliable and lucrative way to finalize an estate. Estate auction is the perfect solution for disposition of a loved ones estate and it alleviates the potential hundreds of headaches of an on site estate sale. Disposing or selling an estate by auction is a much more rapid and lucrative process than conducting an on site estate sale. At Orlando Estate Auciton our process is designed to be the least intrusive and most accurate process in the industry. Our professional staff will collect, catalog, display and sell your estate inventory at our licensed estate sale auciton house with utmost care. With a quick move out of your estate sale valuables and showcasing them in our warehouse and estate sale auction facility, your valuable real estate is open to clean and preparation for sale in as little as two days from your initial call to us. This quick estate removal from your real estate leads to our rapid estate liquidation. Our average estate sale by auction bidder travels 28 miles to get to our facilty and attends on a regular basis. Our regular bidders have a regular bidding number and reserved seating in our auction gallery. Estate sales by acution have a customer base that varies from high end antique dealers, antique store owners, decorator furniture store operators and specialty niche furniture store operators With our following of retail store owners bidding against each other, your estate inventory will garner the higest prices possible in the current retail market economy. The highest retail resale value value of used furnishings is achieved only at an auction type setting. With bidding competition setting the selling price rather than a bargain shopper, selling your estate by estate sale by auction is most advantageous to our consignors. These regular bidders are a large part of our bidding audience yet we cater to more than landed store owners. Our estate sale by auction bidding audience also contains a segment of jewelers, gold and silver resale dealers and coin collectors. These specialty estate items are showcased by our staff walking and courting the audience with each item. This preview immediately prior to sale insured that your valuable estate jewelry, coin collectoriosn or gold and silver items are not overlooked by any of our bidders. Our showcase staff are knowledgeable in which bidders are interested in these specialty estate items so that the highest bid can be achieved. Our showcase staff further protects consignor values for sales of estate jewelry, coins, and gold and silver by previewing these items to the entire audience immeidately prior to the sale of each item, making sure that new bidders are aware of the item prior to its sale as well as the regular bidders. Additionally our base of bidders for liquidating your estate includes art dealers and art collectors. Both fine art and decorator art galleries regularly attend our estate auctions. These art bidders may also be art appraisers and are knowledgeable in the fine art and decorator art markets. The competition between these various dealers and galleries enables our estate art auction segment to achieve optimum pricing for estate art no matter if its fine art, decorator art or amateur art. Collectible dealers and collectors also attend our estate sale auctions on a regular basis. Some of these may have online stores, some landed stores and some at antique stores, antique malls and collectible stores. With this collector crowd contains many locals that attend our estate sales by auction regularly for personal decoration and collection purposes. For these buyers there is no time to go to the online estate sales various websites and brows the thousands of photos only to have to drive to various on site estate sales to build their collections. It is most beneficial to these collectors to attend our auctions that are held twice every week to build their collections. Our estate auction also caters to the automobile and sport vehicle dealers and collectors. By consigning your estate with our estate sale auction you will put your vehicles in front of thousands of potential bidders including car collectors, car dealers, sport vehicle dealers and sport enthusiasts. This large audience of bidders for your vehicles ensrues that your vehicle in your estate is sold to the right bidder at the best possible price for the current market. We also sell sport vehicles such as boats, motorcycles, all terrain vehicles, recreational vehicles and others. Estate vehicles sold at auction are the best way to achieve a fair price for your vehicles. After the close of our estae auction nothing is left over to deal with, as we are an absoloute auciton everything must sell. The only thing left to do is to provide our consignors an accounting of the sale and issue a check. Disposing or selling an estate by auction is a much more rapid and lucrative process than conducting an on site estate sale. On site estate sales typically are conducited over a three to five day period in which your real estate is used to host curious onlookers, lurkers, nosey neighbors and a few bargain hunters to enter the estate sale house and pick around. These types of estate sales companies for estate dispostion tend to have a following as any business does. This following typically will preview photos that are available ahead of the sale for a random amount of time. With no set schedule for posting photos many prospective estate sale customers may not have time to preview the estate and will pass it by due only to the chance timely or untimely posting of images. The size of the following of an on site estate sale is proportionate to the pricing of the inventory, thus, the lower the pricing on a regular basis, the larger the crowd will be drawn by this type of sale. With as many as 100 on site estate sale companies located in Central Florida, this level of competition drives pricing points on your valuable estate sale valuables lower. In short, estate sales companies that advertise large crowds tend to have very low pricing of valued estate inventory. If by chance a photo did catch the eye of a prospective estate sale shopper they will arrive in time to line up on the lawn of your real estate and wait for up to three hours to enter the house when the sale opens. The reason that these estate sale buyers will wait is in hopes that a valuable item was mis-priced. Estate sale shoppers tend to be selling items online on Ebay or Etsy and need to find great bargains to balance the high cost of acquiring estate sale items and ever rising shipping costs. The typical on site estate sale shopper will not drive more than ten miles from their home location for an estate sale limiting the turn out for these estate liquidation events. The remainder of the possibly hundreds of people that will be cycling through your home or your loved ones home are typically onlookers who may purchase a token item if by chance the perfect costume jewelry brooch or glassware set happens to be in your estate. Otherwise they leave with no purchases. This excessive traffic through your real estate and home provides unnecessary wear and tear on the property. The parking issues that are caused by having this type of on site estate sale at your florida estate home or your loved ones florida estate house are troubling to the neighbors and neighborhood in general. The big day of your estate sale by on site estate sale company will be the last day when typically all items are posted to be HALF OFF. This fire sale is intended to clean out the property and it does help move some of your estate sale inventory yet at a discounted rate. In this case, all items sold on the last day are discounted at the on site estate sale due to lack of attendance. Without an interested buyer being in the close vicinity of the estate sale your valuables are suddenly losing value. After the close of an on site estate sale in central Florida most of the inventory tends to remain. This is the result of unknown value at time of pricing and lack of buyers for the available inventory. If the right buyers are not connected with the sale then the result is less than spectacular. The image above only begins to illustrate the disadvantages of an on site estate sale. These bargain shoppers have lined up and waited for hours hoping that an item or two have been drastically underpriced. With bags in hand they shop your small value items that can be easily carted home in a bag and sold onlie with small package shipping leaving your large items of increased value to be left at the end of the estate sale. Don't get caught up in thsi type of sale and allow your estate to achieve its highest value through competitive bidding at our Orland estate sale by auction.